People like this keep us grounded no matter how high we may fly. I think the same goes for camping and getting away from it all for a few days at a time. This is a wonderful portrait. I love the snow on his head — gives us a clue about his surroundings even though they aren\'t visible in the shot. I like, too, the detail on his face. Light is perfect. The story behind "Buddhist monk at Rongbuk Monastery, Tibet"
It’s a harsh life at the Tibetan plateau, but if you want to stay in the highest monastery in the world, looking up at Mount Everest from 5000 meter above sealevel, then it is even harsher. 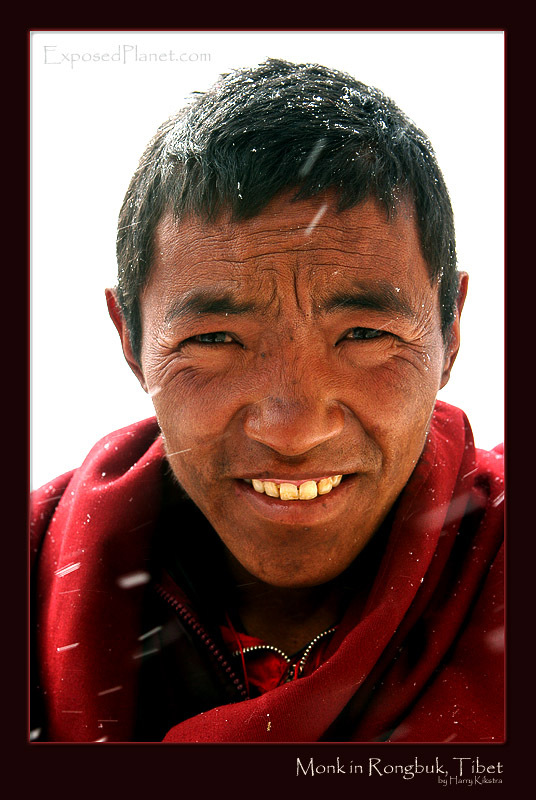 This monk keeps on smiling and is friendly to all the passing climbers and other tourists. He has chosen a simple life of poverty and devotion and is happier than most of us at sealevel. Though I enjoy the western goodies too much -like you, else you would not be able to see this- I think it is good to meet people like these regularly.